Fullbright recognises ToP & Kelsey! Threads of Peru has been lucky to have had Fulbright grant recipient Kelsey Quam, from Oregon USA, working with us since last September. She has been helping out on a large number of projects, and learning how much there is learn about the communities! Kelsey submitted the above photo in the first ever Fulbright Photo Contest, which received over 2, 390 submissions from Fulbright grantees across the world. The photo was chosen as one of the final 20 photos… and then as the GRAND PRIZE WINNER! The photo was taken by Ariana Svenson during Kelsey´s first visit to the communities, in late September 2009. During this and subsequent trips Kelsey was working on updating the weaver profiles – in this case the remote women of Chupani, some 3 hours walk from the road. 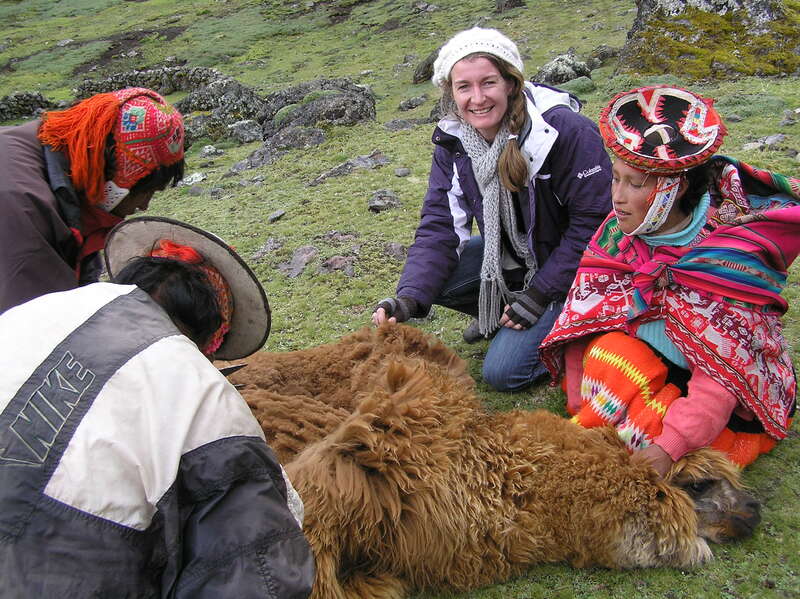 Threads of Peru would like to thank Kelsey for her ongoing work, which is greatly appreciated. The Andes have a wonderful tradition of giving at Christmas, known as the “Christmas Chocolatada”. Larger organizations, businesses, families or even individuals prepare hot chocolate, bread and perhaps toys to give to those less fortunate than themselves. If you are around Cusco at Christmas you see long lines of people waiting to receive their hot cup of chocolate and bread. It’s a lovely tradition, that could be well duplicated in any part of the world as a way of spreading Christmas cheer. On Sunday 20th December, some 15 people from Apus Peru and Threads of Peru made the two hour trek to Chaullacocha to deliver the Christmas gifts. Guides, cooks, drivers, office staff and some of their children (the youngest just 7 years old) made the hike, all donating their time and energies. Apus Peru cook Martin serves up the hot chocolate! [/caption] Apus Peru, in conjunction with Threads of Peru, believes that it’s important to go to the people, rather than making them come to us. While the rest of the year we are ‘super conscious’ of giving and working with the communities according to traditional rules of reciprocity (ayni), at Christmas time we participate in a typical way. 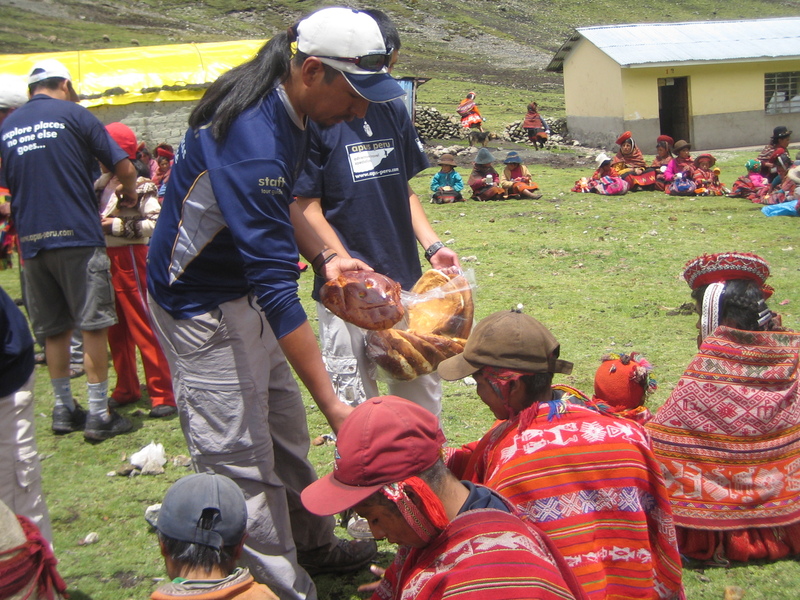 While the Christmas Chocolatada is not directly ‘development work’ it is part of being involved in the high Andean communities. Such involvement and participation in typical events is what we hope helps us to be viewed as an organization that is a part of their community, not one that comes from the outside. Anyone who has been to Cusco will still have the vendor’s sales pitch of “baby alpaca” ringing in their ears. So what is baby alpaca? Do they take the doe eyed little babies and rob them of their fleece? Not exactly – so called “baby alpaca” is the first shearing of an adolescent alpaca. 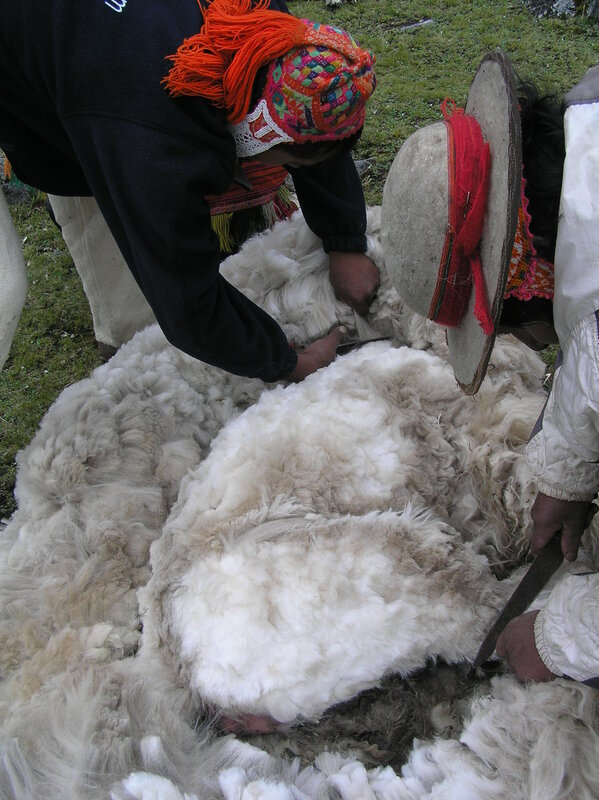 We’d been interested in learning about this for some time and so had organized with our Lares region muleteer, Fortunato to see a first shearing. They shear in the wet season because the animals will supposedly grow fleeces faster after the shearing. We met a still nervous Fortunato in the village of Patacancha, as he took a worried look at Kelsey’s parents who had just flown in from Lima the day before and obviously feeling the effects of the altitude. But off we went – not knowing that Fortunato’s community was 2.5 hours climb straight up. Slow and sure always gets you there, and after a nice freezing Andean shower of rain I personally never felt happier than to arrive at Fortunato’s house in Ipsaycocha (altitude 4250m). While obviously still an Andean house, with dirt floors with cuy (guinea pigs) running about, animal skins in the lofts and filled with smoke from the dung fire, Fortunato’s experience with tourists showed. A thermos with cups of tea was set out on a tablecloth on his table and food was served to us with ceremony. (Quite different than a lot of houses that don’t have tables). Reinvigorated - we found out that we still had a good half hours walk uphill to where the alpacas were pastured – spectacular craggy peaks, with clouds swirling about and the Ipsayccasa Pass (4500m) to our left… breathtaking because of its altitude but also the sheer remoteness. 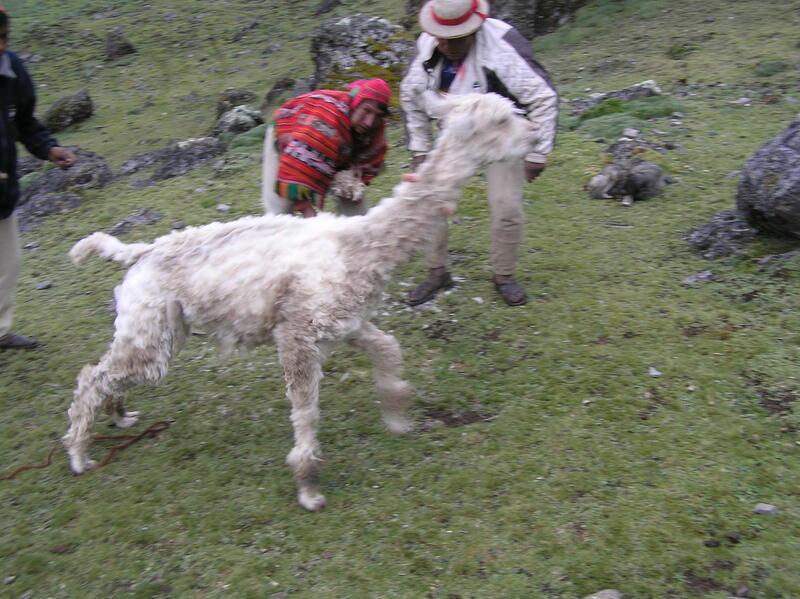 As we got closer to the herd, men in red ponchos emerged from the landscape as they ran, circling the alpacas… we could hardly breath let alone run… from behind us came Fortunato’s young wife Grimaldina, with their 3 month old baby girl, Magaly on her back. From here on, Grimaldina kept the entire herd in order as the men went about making the offering to the Apus. As it’s going to be the first shearing of the alpacas, its important that the earth is properly respected. As Norman was still coming with the “despatch” - ingredients for a proper ‘payment’ to the earth, Fortunato said we could just do the payment to the Apus using the ingredients that they had on hand – huayruro (the red seed from the jungle), kanichiwa, various herbs, and dried blossoms. (A full dispatch has a very wide range of items, including a dried llama foetus). Let by Fortunato’s father, the men made kintus (three coca leaves) and blew on them, asking the blessings of the gods. Later, they filled conch shells with wine and threw the wine at the alpacas. We followed suit like a bunch of ignorant gringos allowed to participate in an ancient ceremony. Then – time for the shearing! Reminiscent of a rodeo the men entered the herd and deftly lassoed the first alpaca, who struggled and fought until three men had sufficiently tamed it and then tied it up. Then the shears previously sharpened on rocks were put to work with the soft fluffy fleece… whilst a couple more men went to work catching a white alpaca which screamed (in a high pitched call) the whole way through the process. 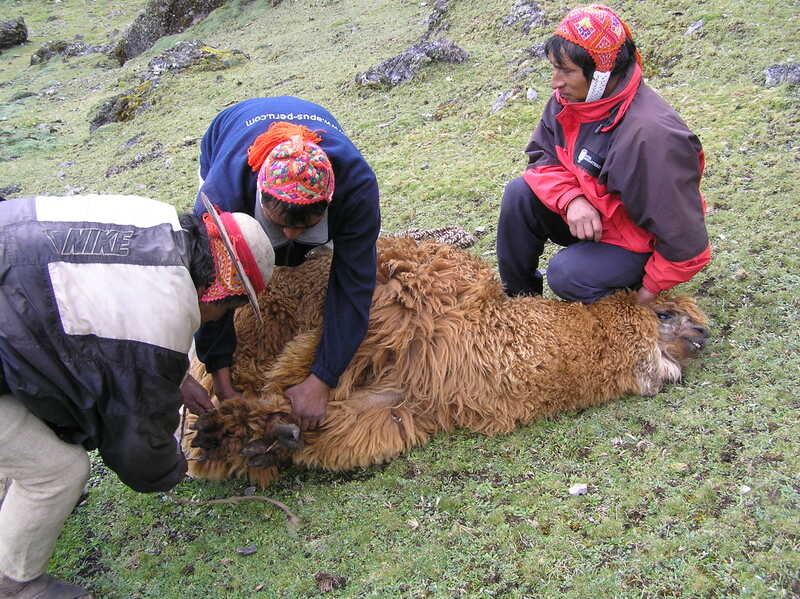 The men worked in two’s with intensity… Fortunato was still worried about us, as he thought rain or snow was coming in over the pass – and he wanted to get the alpacas shorn and us back to his house. 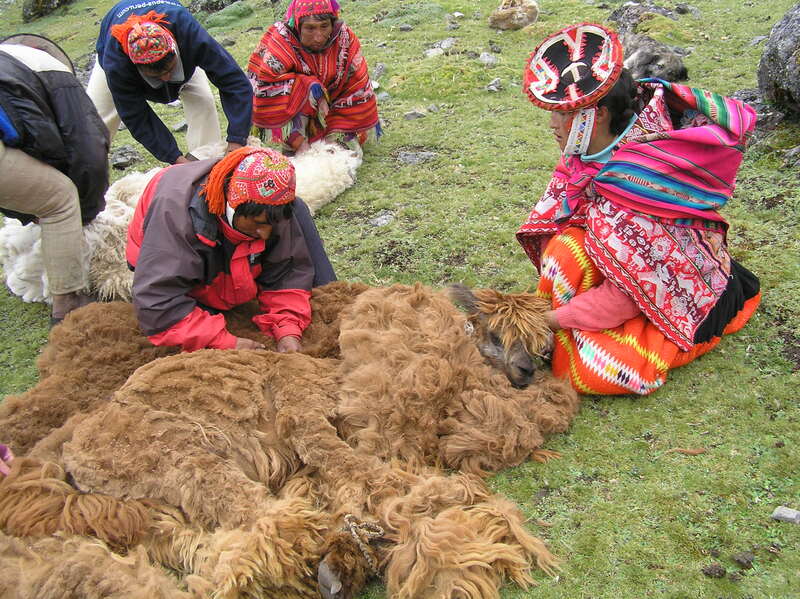 Once the shearing was complete – the alpacas amulet (which is put on the truly ‘baby’ alpaca around Easter time of each year) was refastened around its neck and a blessed stone was run over its body – so that the fleece grows well in the next year. The fleeces were bundled away and we were shepherded back down the hill where a lunch of guinea pig and trout (caught in nearby Ipsaycocha) was proudly served up to us. As we were eating, Norman arrived (with the despatch & more gifts of food for the family), accompanied by Fortunato’s nieces and nephews which were returning from school. (Yes, they walk some 1.5 hours in difficult terrain daily, just to reach school). In all, a fascinating and spiritual day – and now we know a little more about ‘baby alpaca! And special thanks to Kelsey’s parents for their fortitude given they had just arrived in Peru! The finished product! The 'screamer' alpaca makes a disoriented getaway in the rapidly failing light. In a continuation of last week’s post, this week we took some 25 women from the communities of Chaullacocha and Chupani to the renowned weaving village of Chayhuatire, which has been weaving for an international market for over 20 years. The women had chosen to visit this village through consensus at their respective weaver’s associations meetings. These visits are part of Threads of Peru’s further improvement of these women’s weaving skills – the visits not only act as a reward for their work during the year but inspire them by seeing weavings better than their own, and by learning about alternative dying and weaving techniques. In Ollantaymbo we collected some more women, most notably Narcissa from Chupani who ran alongside us until we realized who it was and let her in. We didn’t recognize her immediately, because she was dressed in typical campesino clothes from the Valley, a floral skirt and sweater. When she climbed in, I exclaimed “Where is your lillkla and pollera (traditional skirt)?” She smiled breathlessly, or perhaps a little ashamedly, and indicated she had her clothes with her. Sure enough, later she looked like all the rest, with her llilkla (cape), traditional hat, and a red bayeta skirt. It’s a sad reflection on society that she was dressed in “Valley” clothes. Sure, she was still identifiable as a ‘campesina’ (rural person) but she was not identifiable as remote indigenous – for her fellow Peruvians - and no doubt the hoards of snap happy foreigners that flood through Ollanta and would make life uncomfortable for a person dressed in traditional clothes. We now had our full complement – 8 women and 1 man from Chupani, 12 women and two teenagers from Chaullacocha and some 6 breastfeeding babies scattered throughout the two cars. In Calca we stopped for snacks at the market, and as the women got out of the car a group of Peruvians were heard to ask, “Where are they from?” knowing that they were Peruvians, but from a completely different world. For me, the day’s personal highlight was being sufficiently trusted by Virginia from Chupani to hold, then wrap her baby and then put it on her back as she fixed it in place using a manta. Our trip home involved another stop at the Calca market for the women to do all important shopping (like women worldwide, they shopped excitedly, not only for food but hairclips and trinkets)… We arrived at the drop off point, from where some of the women had a 3 hour walk, at dusk.. With adjustment of their loads, held in mantas on their backs, along with their babies… they commented on the freezing cold and then they were off, scampering down the mountainside. As we drove off, I looked back and I could see them in the rapidly failing light, walking at a deadly pace in Indian file, their pollera skirts moving in rhythm, wiggle-waggle. Hola and welcome to the Threads of Peru blog. 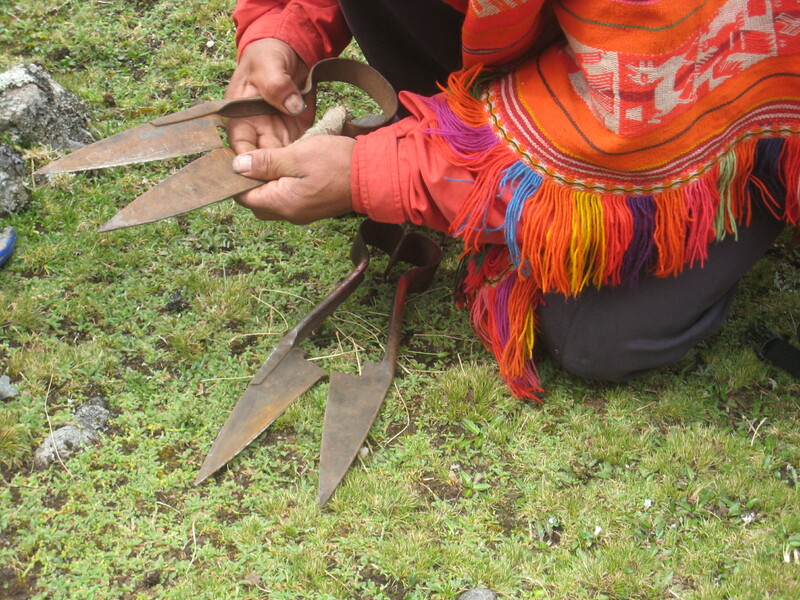 Our blog has been created to provide frequent updates on our activities in the high Andean communities where we work. 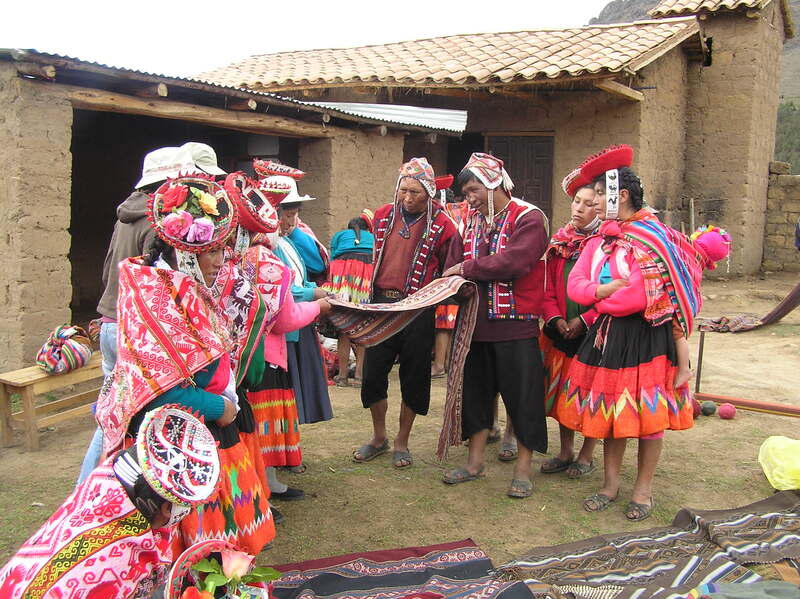 Threads of Peru is a not-for-profit, non-governmental organization (ngo) registered in Cusco, Peru. The founding members represent the countries of Canada, Australia, and Peru. 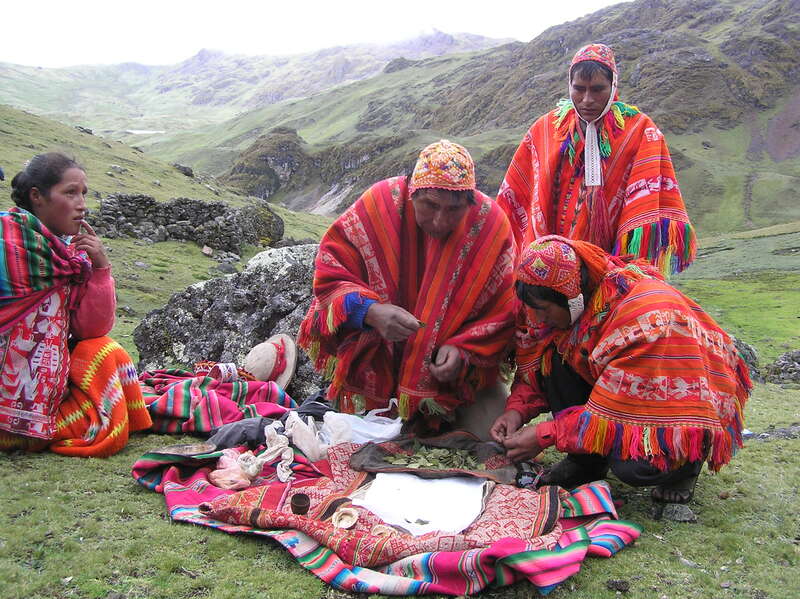 Threads of Peru are currently operating projects in high Andean communities which are located above Ollantaytambo in the Sacred Valley. 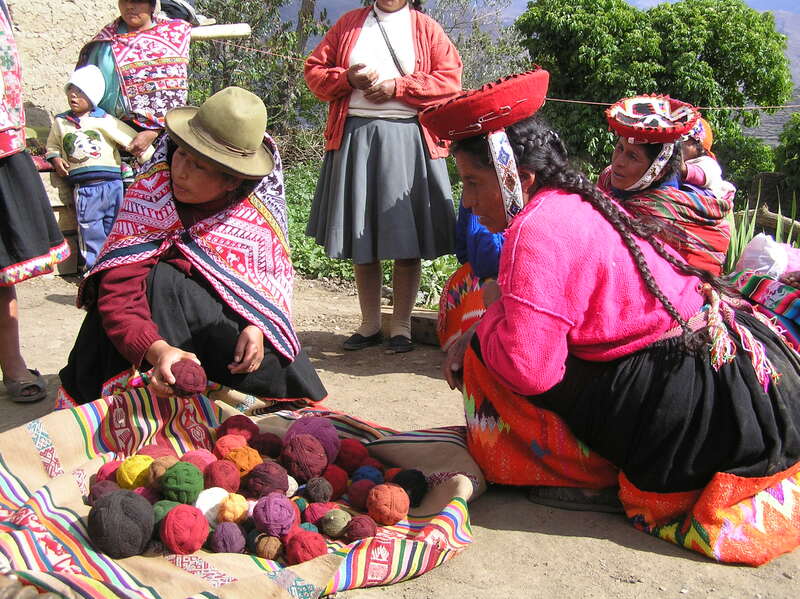 We work with the women of the weaving associations in the villages of Rumira Sondormayo, Chaullacocha and Chupani. Our work involves frequent meetings with the women of each assocation. After the development of weaving projects it became obvious that if Threads of Peru was to increase the income of the women, we also needed to provide capacitacion on how to spend their money responsibly, effectively and in the best interests of their family. Our monthly meetings include the following capacitacional aspects, delivered by Quechua speaking professionals/experts. 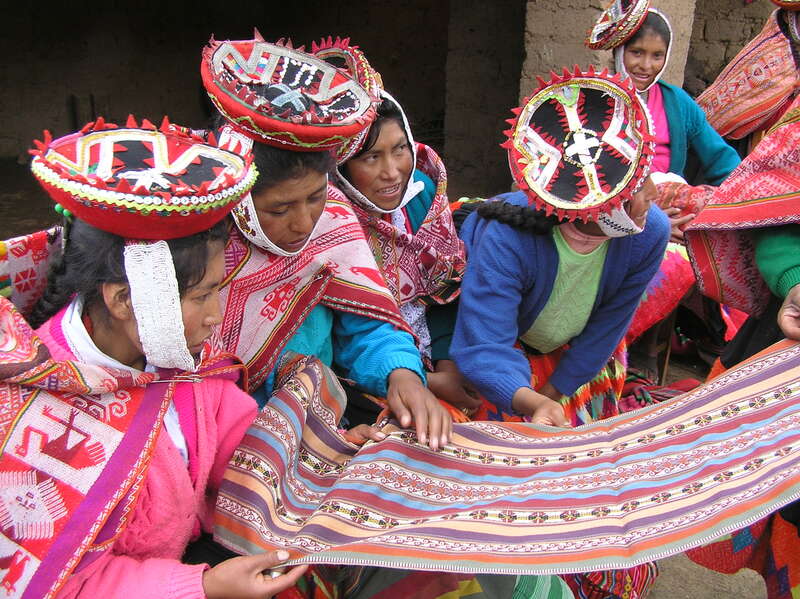 * The thread that ties the groups together and is the common theme is revitalising traditonal weaving traditions. 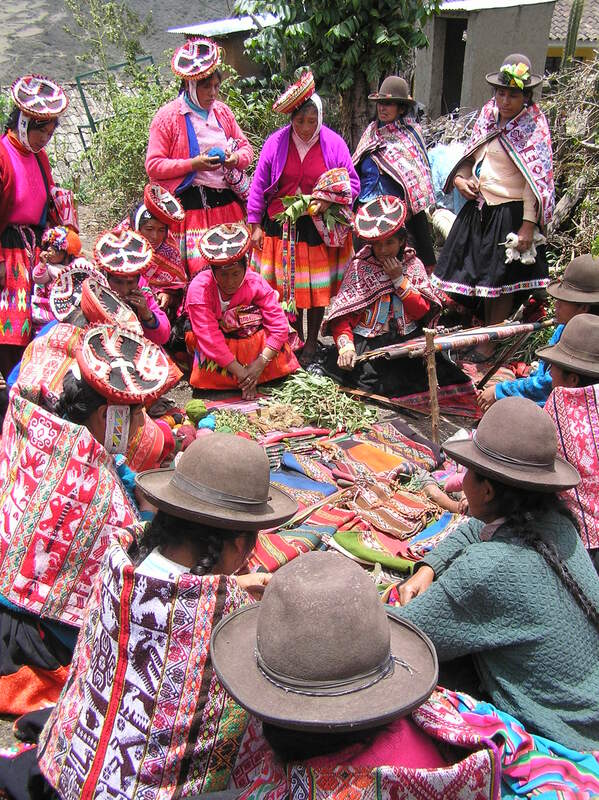 * Monthly meetings include workshops on dying, native plants, spinning, Andean iconography and weaving techniques. * Improving the quality of the weaving, through capacitacion and insipration is a common theme. Weavers are inspired via weaver exchanges, field trips and visits by well known weavers. * "Better living" workshops include speakers on nutrition, hygiene, family planning, the effects of alcohol on the body and also empowerment that enables women to identify domestic violence. * Those women who are interested or have aptitude are also encouraged to take basic Spanish lessons, as well as administration and governance classes. * Plans include further developing the nutrition aspects of the program to include growing their own foods. Over 12 months ago the women of the weaving associations had suggested to us that they would like to visit and learn from other weavers.. 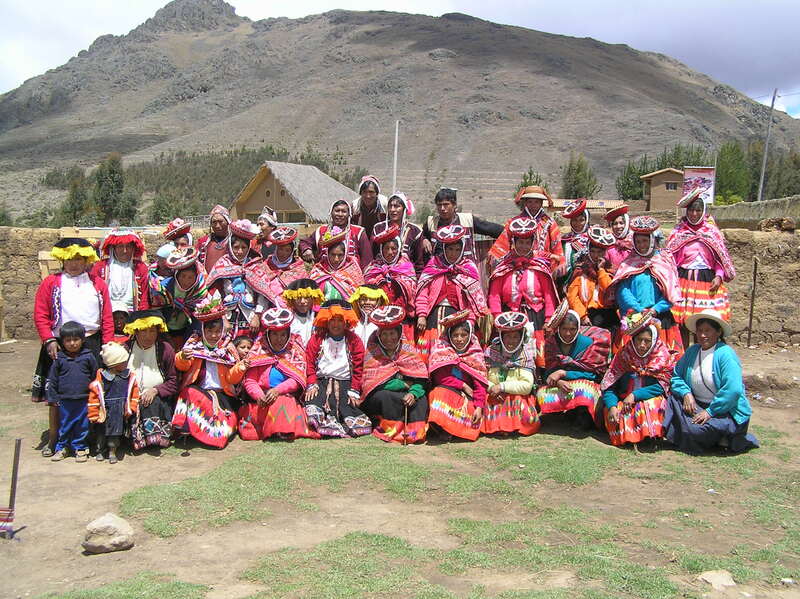 It had taken a year to organize but on November 11th 2009, the women of Rumira Sondormayo were to visit the weaving villages of Choquecancha and Ccachin. They chose these two villages, located down the Valley from Lares, in a group meeting a few months earlier. A 3.30am departure from Cusco had the Threads of Peru team bleary eyed, but when we got to Rumira Sondormayo to pick up the women of the weaving association they were all dressed in their best and bright eyed, peering about, full of anticipacion. So off we headed, our convoy of two cars filled with 14 women and two babies, with our first stop in Calca to repair a flat. Politically, its always useful to use someone’s family in these things – in this case the second car we had hired was our weaving teacher, Agustina’s cousin… and whose car had a flat straight away. In the Calca market, tourists en route to somewhere, stared at our colourfully dressed ladies as they scampered excitedly around buying treats that are not usually available to them. I guess one never forgets that they are unique, but seeing them through the tourist’s eyes was a wake up call. It was 5 hours drive to arrive at Choquecancha, our first visit… a pretty long trip by our standards, but the women sat bolt upright, looking around and out the windows with intense curiosity. Mainly, they were silent, only occasionally exclaiming about something or another. Choquecancha has an amazing Inca wall within the village and ruins all about. By some bad communication (fairly typical of Peru) the women had thought we were arriving the week earlier and so had prepared an extensive dying demonstration for us… but this week their presentation was the “light” version. They do not use imported indigo to make blue but have developed their own blues using two different plants. They also explained how their association is structured and that they sell via Casa Campesina in Cusco. Agustina, our weaving teacher and also organizer of the visits, was in a rush to get over to Ccachin, on the other side of the valley. She was originally from Ccachin and we were to visit her cousin Paulina, the president of a weaving association. Again, you wonder to what extent politics played a part in our brief and somewhat unorganized visit to Choquecancha. Regardless, the women were happy to go – the insididious jungle biting insects were playing havoc with them, some had blood running down their legs from the bites.Before we left, Paulina and Juliana rushed off with one of the women of Choquecancha – we got a glimpse of dirty unwashed wool being carried away and some time later they returned with a sack of beans and maiz. It was the most emotion that the women had showed in the whole time in Choquecancha, and evidence of trade happening. 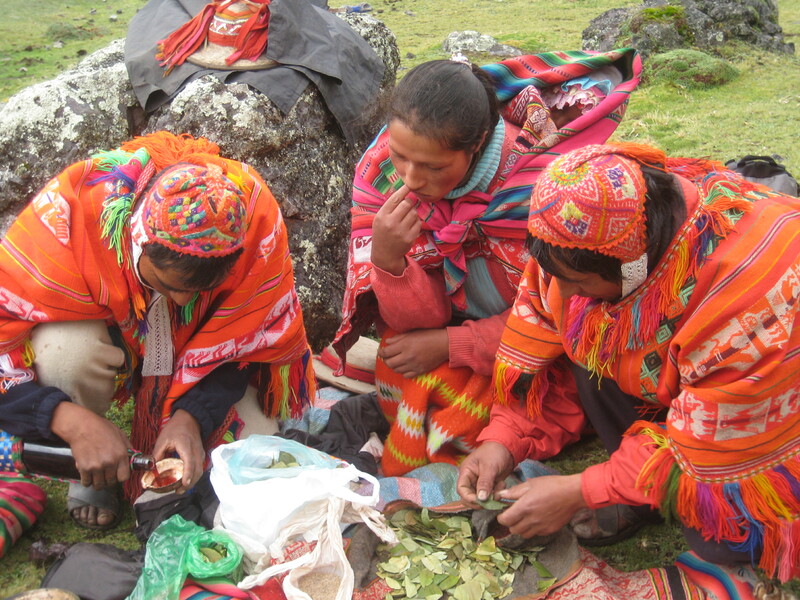 (in fact the most emotion that the women showed during the whole trip was during ‘shopping’ time – they all bought beans while in Ccachin and there was some more trade going on too). The drive to Ccachin is breathtaking – probably a 1000metre descent and then another 1000 metre climb on a torturous road with precipe like cliffs. The weaving association here was not nearly as organized as across the Valley – but with some prodding they got a weaver set up and some weavings out… then came a massive two course lunch – maiz cream soup and lisas with the stomach of some animal… Smile and keep telling them how delicious it is! The conversation in Ccachin was probably the most valuable for our weavers, as they explained their organization. 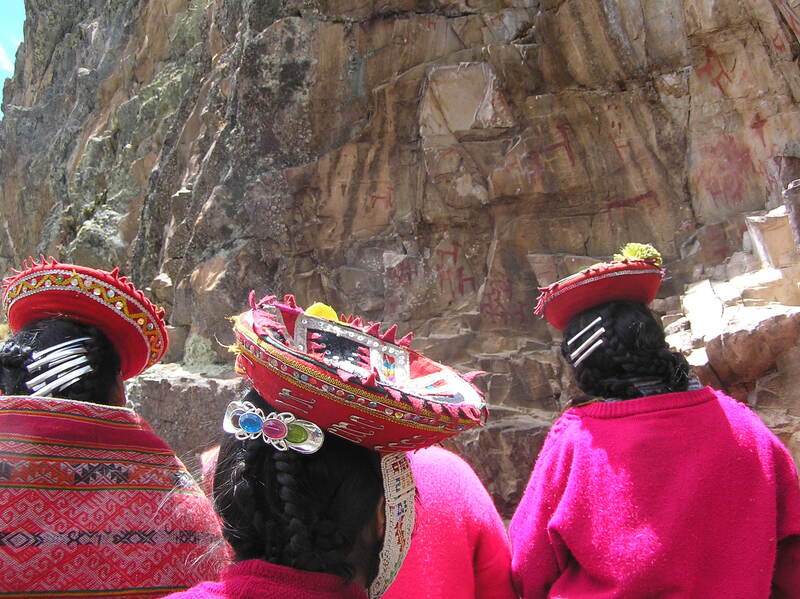 Of course, most of the conversation in Quechua goes well over our heads… ! However, for me, the importance of Corredor Cusco Puno in capacitacion came up again and again. Also Paulina proudly showed us a prize she had won in a nationwide weaving competition… The importance of ‘concursos’ or shows has also been evident in a number of visits now – to get recognition you need to compete with your weavings. The return drive – less time with fewer stops – was a stark contrast to the drive there. The women giggled constantly, chatted and were very excited. At a pit stop Mercedes and Marina worked hard with stones cutting up a dead looking plant – excitedly explaining it was very good for a sick stomach and infection – which is what Mercedes’s sister Mattiasa has (and precluded her from taking the field trip). Maybe they were relaxed or maybe they were just happy to know they were going home? In the end of January the Cusco region suffered excessive rainfall, which led to the extreme flooding of the Urubamba river and much damage in the Sacred Valley. A State of Emergency was declared for 60 days. Most publicized in the international media was the washing away of railway tracks that access the famous citadel of Machu Picchu and the subsequent stranding of thousands of tourists in Aguas Calientes. While the situation has now normalized to some extent, the overall damage to infrastructure in the region is yet to be counted or fully understood. Approximately 10km of the Lima – Cusco road has been washed away and key bridges (Pisaq & Izcuchaca) have been seriously damaged. 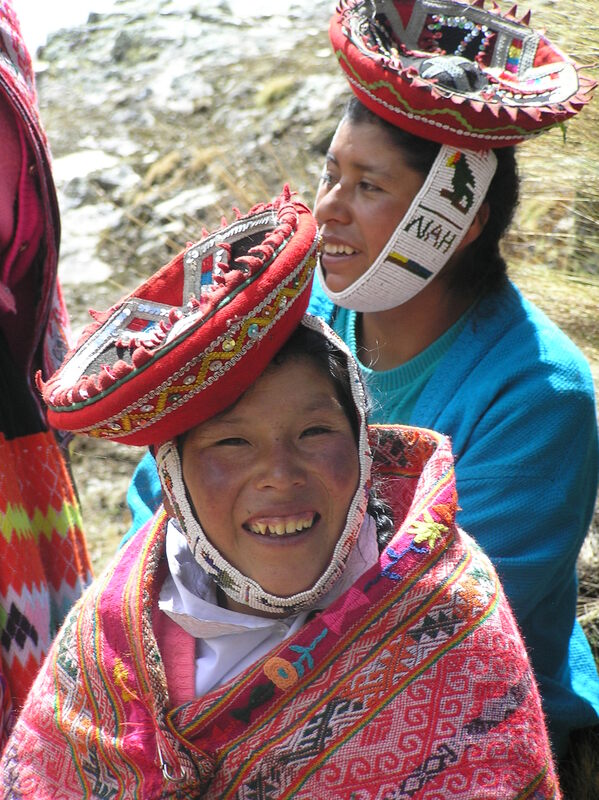 The communities Threads of Peru works with are high altitude communities, so are not situated in the river valleys which suffered most of the damage. We have had two staff members visit communities in the last two weeks and they report that little damage has been suffered, apart from some small landslides. We will continue to monitor the situation, and if required, offer emergency assistance. At this stage we believe that there will be long term or flow on impacts, created by diversion of funds for emergency relief in hard-hit Urubamba. (ie Chaullacocha pertains to the Municipality of Urubamba).